"I love you like a fat kid loves cake. You know my style, I say anything to make you smile." Ahoy! The candy bar layercake above is just a taste of why I haven't been blogging or commenting very much lately - the Ogre, I and our trusty crew pillaged together our pirate wedding in less than six weeks. I shall be sharing more treasure from our September 29th celebration as soon as the tide will allow. I love the cake and the whole pirate wedding theme, my husband would have loved that. I am following you now and love your art work! Stop by to link up your WW at www.bigfoottribe.com, I'd love to have ya! oh my! that's a gorgeous cake! makes me think of coffee and dusky afternoons :-) yummy! The cake looks amazing and I bet it tastes amazing too. Looks decadent. Need a definite sweet tooth for that yummy looking cake. 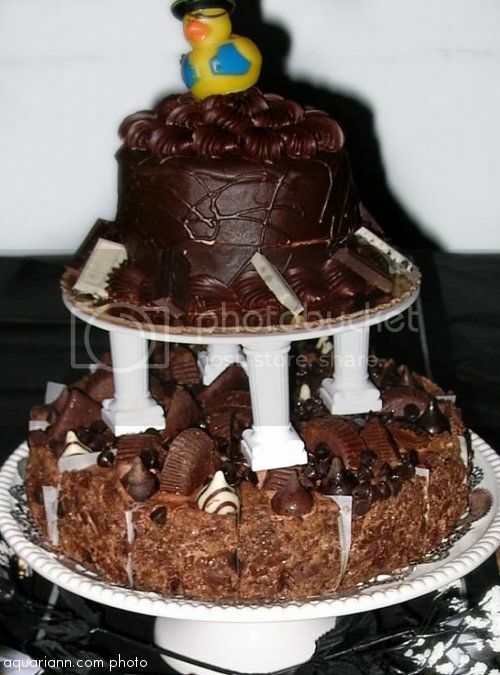 I absolutely love chocolate, chocolate cake! In fact, this is my birthday request every year. Everyone else in my family usually goes with chocolate cake with vanilla frosting, so I have to break from tradition and yum do I like it. Especially served with peppermint ice cream. Peppermint ice cream? Yes, my bday is in December & this is the only time we can find it in our area. So, I HAVE to have it! Now, you got me wanting chocolate cake. Drats you! =D Thanks for hosting! Wow! I think you found the treasure chest! I am not sure what I like most about the cake, the decadent looking chocolate or that awesome rubber duckie at the top!!!! Sweet post. Looks absolutely fabulous, love the pirate duck. WOW! Now that is a cake!! Oh my, that cake looks delightful! That is one awesome cake! Congrats! The ducky is too awesome. I'm sure that the cake was delicious, too. Looking forward to hearing more about everything. Awesome cake! :) I need a piece of chocolate! Congrats to you and the Ogre! That cake looks amazing!!!!! And, girl, six weeks to put together a wedding?! SUPERWOMAN! Congratulations on what must have been a smashing event for such a fabulous occasion! The cake looks so decadent and wonderful, I love the pirate duck. Please accept my best wishes on your recent marriage! That is a great excuse for not blogging. The cake looks yummy! Congratulations on your wedding! Happy pillaging, plundering and looting to you! The cake looks awesome!